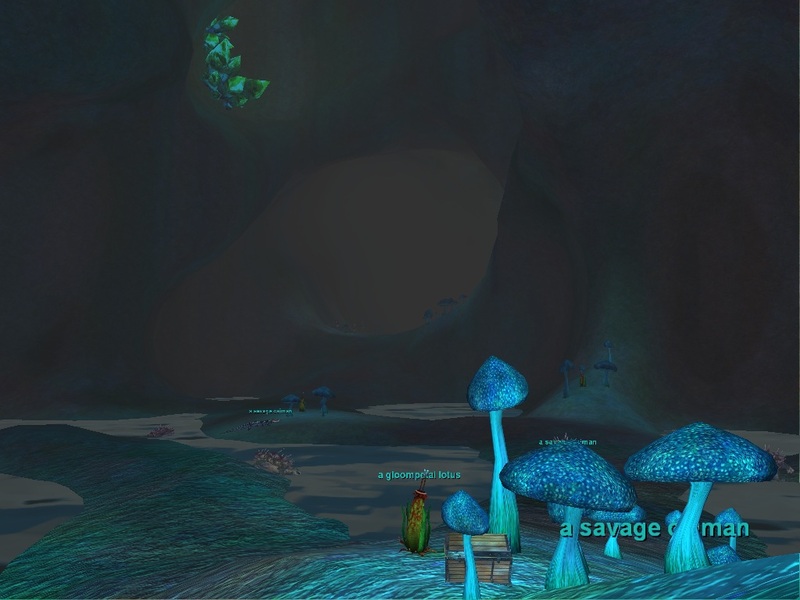 The Vergalid Mines are located in the mountains bordering Sunderock Springs. 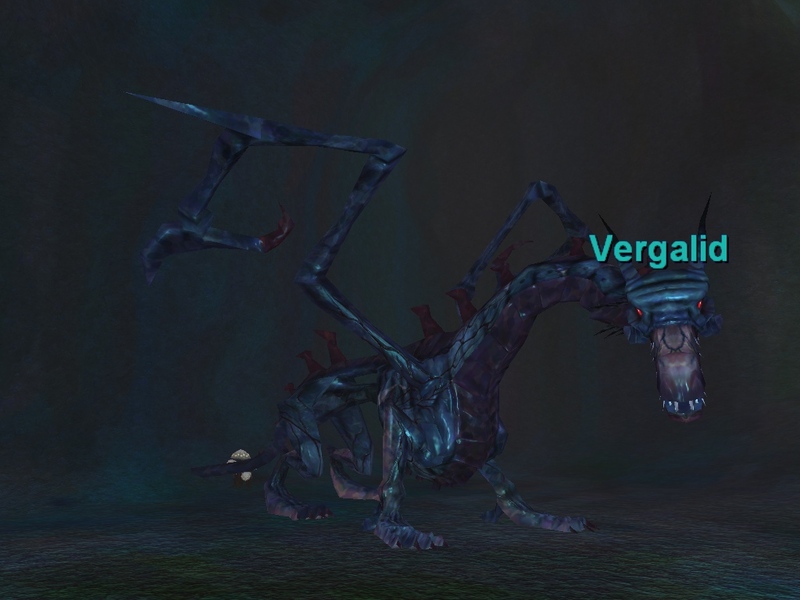 Their namesake is the undead dragon Vergalid. After enduring years of torture at the hands of Lethar and his offspring, Vergalid was released from the temple of Ashengate. Phsyically and emotionally exhausted, the dragon inched his way down the mountainside. A single misstep led to a 300 foot fall, sending Vergalid into a state of unconsciousness for two years. He awoke and continued his journey, determined to find a lair to call his own. He eventually found a network of mines nestled in the Serpent's Spine Mountains where, once again, he fell into a deep sleep. Again he awoke, and this time found himself magically shackled in place. 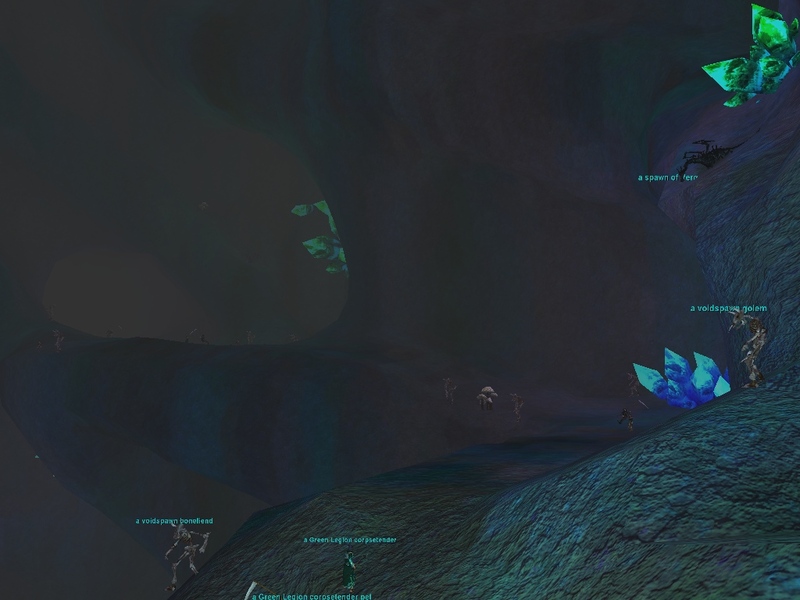 The Green Legion Drakkin, whose duty it is to serve and protect all of Veeshan's kind, found him and now tend to him in the deepest point of the mines of Vergalid. Showing 25 out of 143. Click here for the full list. I looked for locations for mobs for a few days. Ended up just clearing the zone completely, then watching track for names. Good thing most things don't see invis. Did much camping here from Lv72 to Lv75 so far. Our group makeup was a Ranger, Ench, Wiz, Pally with both a Cleric and Tank mercenary communicating over vent. Did most of our camping lower down the north part of the zone where the keyed door is to get to the lower part. Its not to bad if you take your time. The group we have is pretty good and the Enc rocks with quick mezzes and good charm skills. But yeah, large aggro radius on everything and its easy to mess up. They key was to have the Ench calm everything in sight to pull 1 or 2. When in doubt, calm it. There is many named mobs down there that drop 190HP/Mana items. Kinda useless to most of us because of the Defiant gear, but we did get a few jewlery upgrades. Most of them are non tradeable which is too bad. Definitely bring crowd control and this zone is easy pickings for good exp. We could easily keep all 3 areas clear. 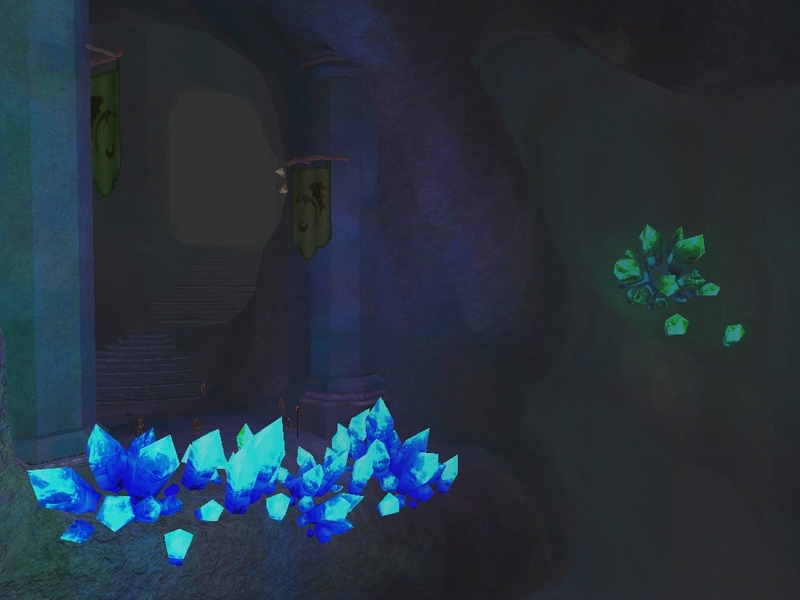 The Trylobyte room with the quest giver, the main hallway with all the Green Legion mobs and then the room with the Giant Stone Guardians. Most of the mobs hit on average for 400- 600ish, max for 900 for me, the Ranger with about 2000AC and most def AA done. But the merc Tank and Cleric had no problem. The repop seemed to be around 20-25 min. The exp is so good that we will all stop at 75 and grind out a few hundred AAs down there. Invis works to get down there, as well as the levitate trick someone mentioned earlier. Now we need the keys to go down further. Safe. It's an empty area with no mobs. You go down an elevator shaft to get to the mobs and the main tunnels. The bottom of the shaft is safe unless someone is down there pulling mobs. Most mob don't see thru it. There are mobs that will see thru it but they come in certain areas. Lots of Overseers roam thru the front of the zone. Pull mobs to the elevator shaft os just kill the roamers as they come thru, they will be a pain. They love to assist each other and have a fairly large agro range. If they look like might assist, they will. I'm pretty sure the roamers are healers and when they assist they will stand back and heal your mobs. Not big huge heals but just be aware. I have no data on how hard they hit but I find it pretty easy to die there. especially with the adds. Make an effort to single pull until you get a feel for the area. Evac will take you back to the entrance at the top of the elevator shaft. To run back to the entrance you'd have to take the elevator back which would not be good with mobs tailing you. The little mobs are hard to see so when you target and pull a mob you can get one of these as an add. I recommend you use your function key (F9?) to cycle thru the closest mobs to see where everyone is. One of the worst zones I've ever seen. Extremely laggy. Mobs are packed in close together. No loot to speak of. I think Sony takes the same approach to their zones, as they do their games. Come out with a ton, and one is bound to be good. I miss Plane of Fire. Best zone ever. Why can't they duplicate the successes instead of failures? atrocious. But after a while it became a challenge. Then it became fun once you meet the challenge and figure it out. Yeah, if you just want to romp around like most it's not for you. I think the loot is a nice smattering (albeit by today's standards the hp's/mana on most are low). The rarity on some select items can be bad though. I liked the Plane of Fire as well. But after coming back here and really finding a use for many AA's, plus being quite a bit more powerful (in solo/Merc. form), and particularly having no one disturbing things (side effect of "Fabled Madness") I am enjoying it immensely. With all that said, while I am old school, the original was the best for more reasons than the game itself. This expansion would get my vote for THEE best, especially if you include/do the Charm of Lore / Wanderlust Aug. quests near when you start out / or are ready to start moving beyond the zones attached to BM. For me it's overall the best balance between quests and killing I have seen them do to date (for many various reasons). I can find plenty to critique, and over the last decade have done just that. But I have to give credit when it's due - I really have enjoyed TSS once I gave it a fair chance. Once you find the camps in this place it rocks. Try ancient trilobites they all come single. If you want to see what is down the shaft safely, wouldn't the eye of Zom be a better way to go? You can buy Gnome tinkered ones with 5 charges on them too. Ok looked under what mobs drop and nothing about a key for the other room.Whats name of key to get in? and what drops it? The "key" is a light blue shard called Arid Indicolite Shard. It's temporary, so you'll need to loot one every time you log in. They do this so that a group of 65s can take the mob...Just no one challenges themselves anymore. I am sure a a full group of 65s could take a 71 in this zone easy. Having the same problem, first noticed it when gated one alt out then tried to get back to camp after doing run to raid. One of my characters gets the message with ending %+(11)10, another %+(11)5, dont know if it a bug or new access quest, been trying different areas of zone, killing different mobs, quests, haven't gotten a change in any of my numbers or any better access. Sigh, wish they would respond to my /bug notices. Anyone have any more or different info? can anyone tell me what mob(s) drops a hammer called: pristine green leigon warhammer plz? An Abhorrent Gloompetal Lotus by name. Get a Arid Indicolite Shard to drop from any monster it seems (have not seen it in the water section). 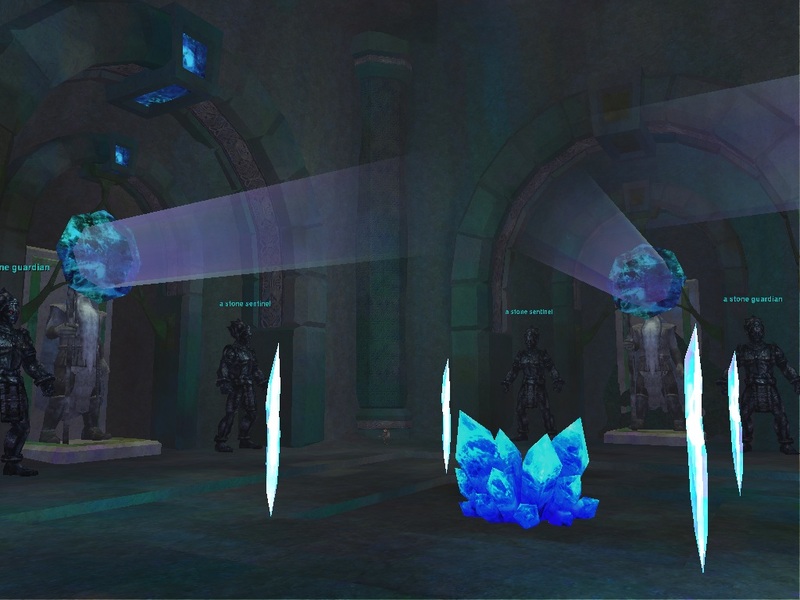 Move to the large cluster of crystals in the last room with the giant statues. 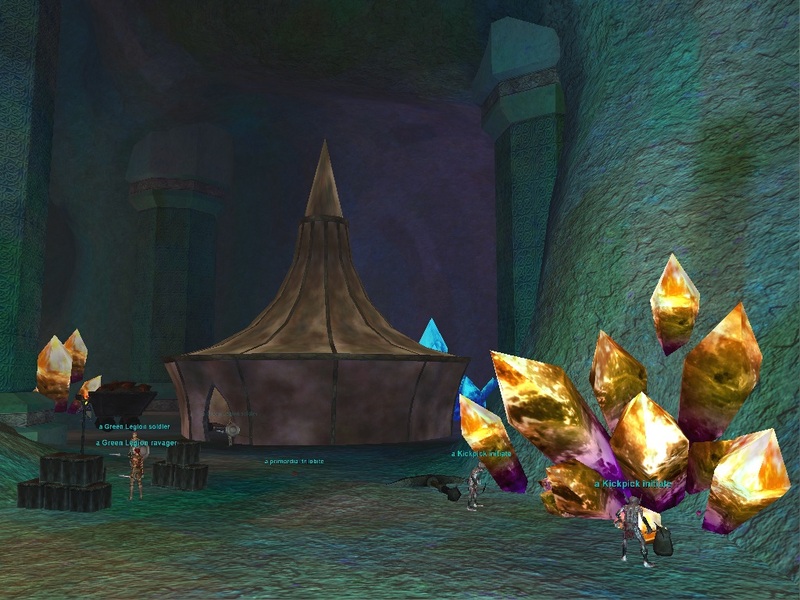 Right click the Arid Indicolite Shard while standing next to the large crystal cluster to morph it into a Flawless Indicolite Shard. 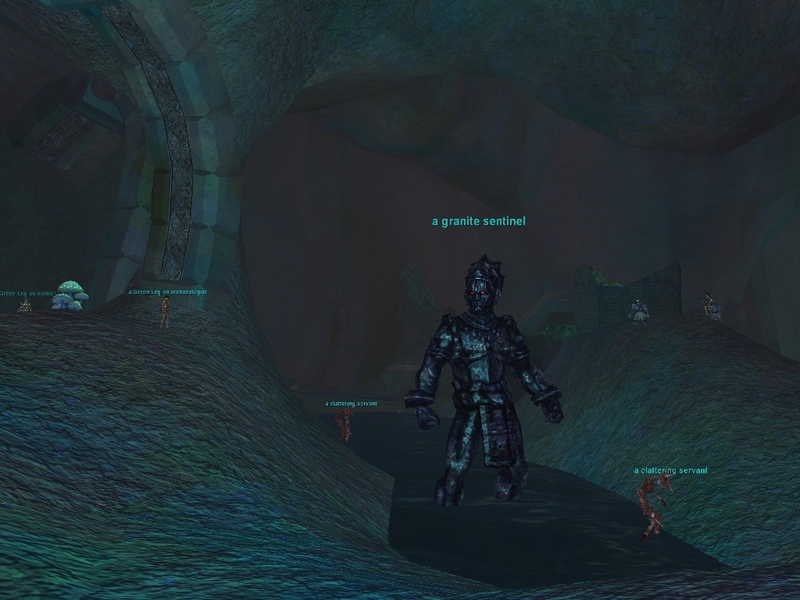 You now can teleport into the keyed section of the mines by clicking the large statue that normally gives the "unmovable" message. Hope this is helpfull. Lore: Believed to be good at absorbing heat, if prepared properly. I think this item is used for a Wraithguard quest that starts in Valdeholm as well. Once I get a piece, I will know for sure. There's a quest for this up in the outpost area in Sunderock. Found it last night, but don't remember who gave it, there are lots of quests up there. Can anyone explain how to gain entrance into the room just straight ahead from the bottom of the elevator shaft? User sicksevertwenty apparently has had the same problem. and ive reached the point where i need to do the part in this zone. i found galstat, the flooded caverns, the shrine to zek and the burial chamber no problem. however im having a great deal of trouble finding the entry hall throne room. i think it is the area behind the great big door that is straight ahead once you drop down the lift, but i cant find any way into that area. i have a map of the zone which shows this area but doesnt have any info on how to get to it. my map also has a marker saying "portal" in the northernmost room, but ive been there and clicked the big tomb looking thing that is there but with no luck. ive also noticed that there is an area that is not marked on my map that is hidden behind a big statue but when i click on this statue it tells me " you are unable to move the giant stone object"
does anyone have any info on any of this? id really appreciate any help. thanx for that info harmonie. btw i think its more than 3 tasks in 3 zones as im pretty sure ive already done at least 8 tasks all together so far (tho i didnt actually keep track of how many tasks are in easch zone) and my charm is showing up as 22 hp/mana/end. also, the quest, apart from being a bit of a run, is (up until this point) really quite easy, you just need to run around the zones and get updates at certain places in the zone. i havent ran into any see invis in any of the zones that ive been in for this quest yet (blightfire, goru, sunderock, the roost, the mines) some of the places are marked on downloaded maps, though lots arent. i just used my initiative and spent a little bit of time looking around. the quest was fixed with todays patch, the said update is no longer required. nice one soe. Who gives that task for the charm aug you are doing ? I looked around and couldn't find out who it was. 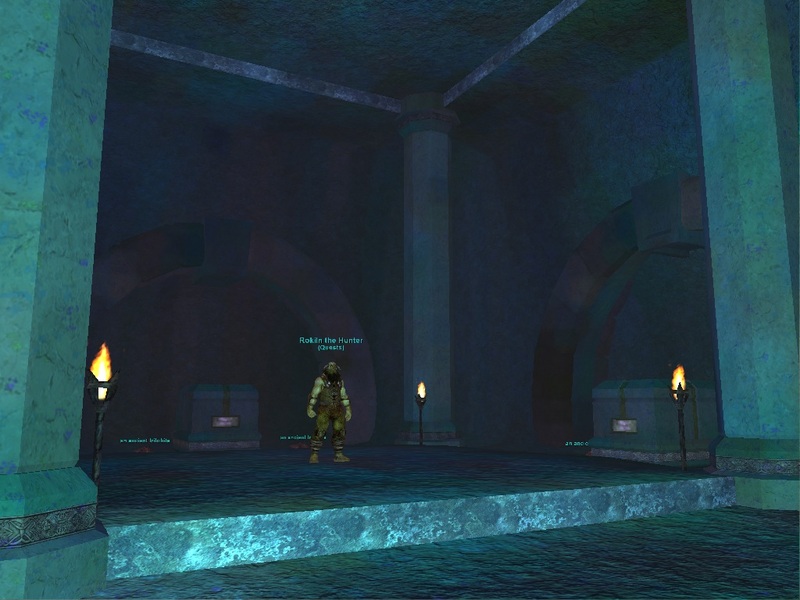 #1 "The Disk of Heroes"
Lore Rokiln's tomb was once a vestibule for storing artifacts of the giants. 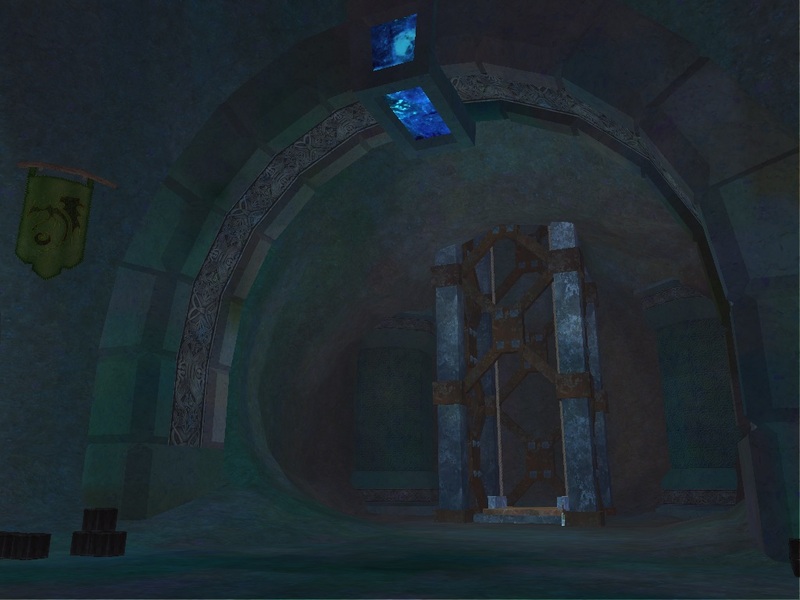 The tomb has since been raided and looted by drakkin who have overrun the mines. Among the objects stolen by Dyn'leth's armies was an old giant artifact known as the Shield of the Otherworld. The artifact held special spiritual significance to the giants as it contained the names of all the fallen warriors, heroes and kings of hte three interlocking disks. Dyn'leth, realizing this significance, smashe teh disk and awarded the broken shards to his various captains and commanders and trophies. 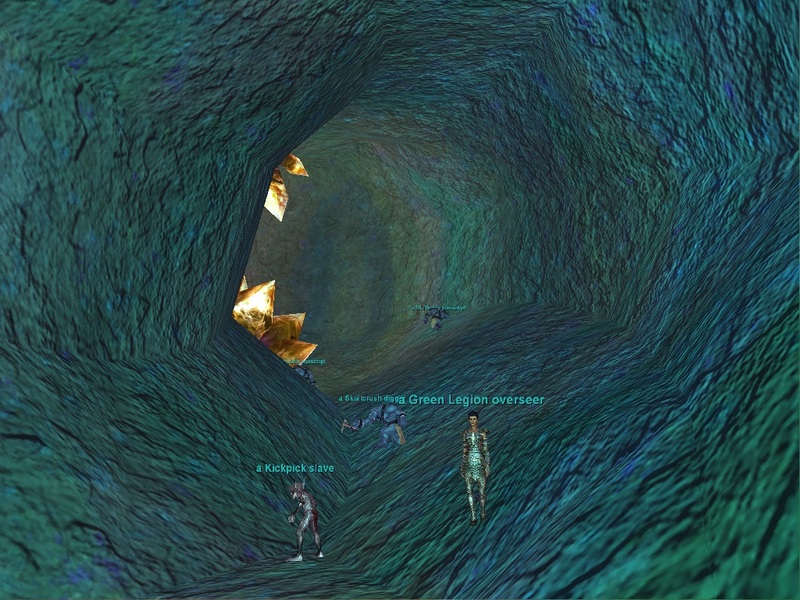 The Disk of heroes was sent with Dyn'leth's followers who were assigned to the Direwind Cliffs. Return the remnants of the Disk of the Heroes to Rokiln at his Tomb. -> " Second Fragment "
-> " Third Fragment "
-> " Fourth Fragment "
-> " Fifth Fragment "
-> " Sixth Fragment "
#1 "The Disk of Warriors"
Return the remnants of the Disk of the Warrios to Rokiln at his Tomb. #1 "The Disk of Kings"
The Disk of heroes was sent with Dyn'leth's followers who were assigned to the Ashengate. Return the remnants of the Disk of the Kings to Rokiln at his Tomb. Explored here a bit last night with a casual group of friends playing tourist (average level 72). Lots of adds. Mobs close together and plenty of roamers. We didn't have a mezzer, so were using root for crowd control, but separating the rooted mobs made our footprint so big that the slightest pet knockback could trigger another four adds. A yellow mob near the elevator dropped a fair caster aug (required level 75). We'll come back when our average level is higher than 72, and we'll bring crowd control.